Levi Pinfold was born in the Forest of Dean. From a young age he loved books and comics and spent many of his days drawing and writing his own stories. At the age of seven, Levi went to watercolour classes where he was introduced to the medium that he still works in. His love of stories, painting and the work of illustrators such as Maurice Sendak, Alan Lee and Dave McKean led him to study Illustration at the University College Falmouth, where he developed narrative illustrations in his own style - a stunning, stylised realism - creating his imagery from imagination. Alongside painting, Levi writes stories in his spare time. Since graduating from University in 2006, Levi has worked as a self employed illustrator. The Django, his debut picture book, is inspired by Levi's love of music. Levi won The Booktrust Early Years Award in the Best Emerging Illustrator Category for 2010 for The Django. 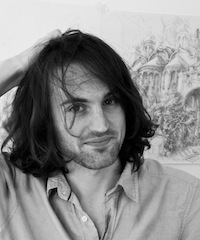 Levi is also one of 10 illustrators to win the Booktrust Best New Illustrators Award 2011. 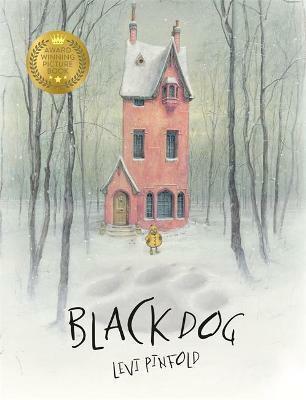 His second picture book for Templar, Black Dog, was published in November 2011 to critical acclaim. Levi is now living in Australia and working on a new picture book for Templar slated for 2014 publication. Creating stories is an organic process for Levi. Sometimes he does a drawing and then the story might come afterwards which is common with people who write and illustrate. He likes to get the text finalised before he starts on illustrations. Levi works up detailed roughs to arrange the order of illustrations so that both he and his publisher know what they are getting before he starts the long process of painting. He typically takes from one to three weeks on each illustration as he likes to paint a lot of detail as he enjoyed detailed illustrations as a child. As a child he absorbed himself in books and comics which were big influences on him as he grew up, as well as fine art as an adult. Levi grew up on Roald Dahl and Morris Sendak, John Burningham, Pat Hutchins, and was obsessed with Clocks, Clocks and More Clocks. He now loves painters like Breugel, David Friedrich and the Romantics. He says that if you cast your net as wide as you can you can take bits from other artists. You can see whatâ€™s possible. The Django was painted in watercolours and gouache and his latest book, Black Dog, is painted in tempera â€“ a mix of pigment with egg and water which has the same light touch as gouache but you can lay down dark underwashes with. A black dog appears outside the Hope family's home. As each member of the household sees it and hides, the dog grows bigger and bigger. Only Small, the youngest Hope, has the courage to face the black dog.